This latest issue of our newsletter is largely taken up with coverage of significant national issues impacting upon us: namely the current pay offer, the recent campaign over pensions, and the effects of the Teaching Excellence Framework. More locally, however, we also report on a proposed restructure of IT support and on a motion passed by members at the recent Branch Annual General Meeting that calls upon the University to divest from the fossil fuel industry. UCEA, the university employers’ association, has made what it describes as a final offer of 2% in this year’s pay negotiations. In March, the various measures of inflation stood at 2.3% (CPIH), 2.5% (CPI) and 3.3% (RPI); so, however you choose to do the maths, the proposed pay increase amounts to yet another real-terms pay cut. 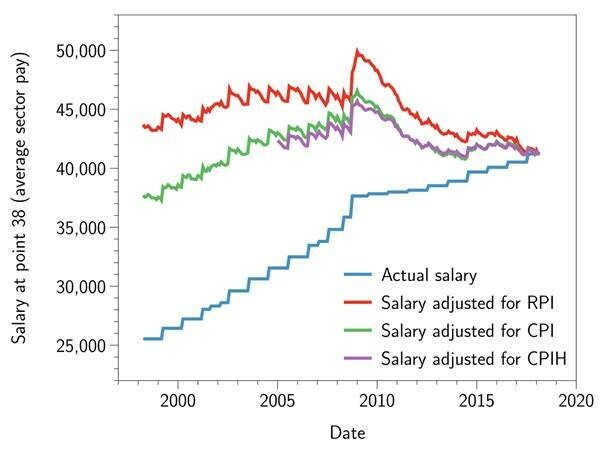 The graph below is based on point 38 (the average in the higher education sector), and it shows rather soberingly how absolute increases in our salaries over the last twenty years become much less impressive when they are adjusted to take account of the different inflation indices. On the basis of contributions made from the floor during the Branch AGM on 16 May, it is possible to conclude that members locally are not currently fizzing with enthusiasm at the prospect of another lengthy industrial dispute. The point was made that, rather than agitating at this point for a larger salary increase, it might be wiser to wait and see the outcome next year of the review of our pensions – an issue with much more drastic consequences for our long-term financial well-being. Also: in a moment of squeezed salaries nationally, would a campaign premised on a demand for higher pay have the same resonance with students and the public as the topic of significant pension loss? Nevertheless, a counter-argument was also made at the AGM: that, with the Union buoyant nationally from a magnificent recent show of force, this is precisely the moment at which to address also the creeping, dispiriting corrosion of our salaries. UCU’s national negotiators have recommended that a consultative ballot be held in June to ask members whether they favour accepting or rejecting the current offer. The national position will be to recommend rejection – with the cautionary postscript that, if we do so, we will need to be willing to take concerted and sustained industrial action from the beginning of the 2018-19 academic year. For the moment, we would ask members to reflect on the pay offer and to anticipate a national ballot within the next month. We have reflected in recent newsletters on the pension dispute’s galvanising effects upon the Branch. Members may also be interested, however, in reading a detailed national assessment of the campaign and its aims and outcomes which has been prepared by UCU’s Superannuation Working Group (SWG). Depending on your preference, the report is available both in pdf form and in rtf format. Any observations you have on the SWG’s document, including the recommendations it includes, would be welcome. Members will be well aware of the effects already upon our sector of the Teaching Excellence and Student Outcomes Framework (TEF) – to give it its full title – which was inaugurated in 2017 and is currently administered by the Office for Students. Now, however, is a suitable moment to offer your views on the scheme. UCU has commissioned a research project ‘on the impact and implications of the Teaching Excellence Framework’, and, as part of this, is very interested in surveying members. The survey is open until 8 June and will take approximately 10-15 minutes to complete: it can be found here and we hope that many members will want to participate. If you have any questions about the survey, please contact the research project team at TEFImpact@bcu.ac.uk . Moving from the national to the local, the University is proposing a significant change in the provision of IT support. Rather than Schools having their own designated IT staff, as at present, the plan is for colleagues in these roles to be managed centrally by IT Services though continuing to be spread geographically around the campus. The Branch would greatly appreciate your thoughts on this proposed restructure, and so has prepared a short survey – including a brief outline of management’s plan – that we hope you will find the time to complete (it is even briefer than the TEF survey and will take you only a few minutes). All responses are anonymous. Please complete the survey by midday on Tuesday 29 May. We apologise for the very quick turnaround time: usually at Loughborough a consultation period would last for a month, but on this occasion IT Services was slow in providing the campus unions with the necessary paperwork. You may recall that our newsletter of 19 February publicised a campaign being run by People and Planet, a body of highly engaged students on campus. The group has been protesting against the University’s investment in the fossil fuel industry and has produced an open letter to the Vice-Chancellor, calling firstly for the withdrawal of any current investments Loughborough has in this sector, second for the release of a public statement committing to complete divestment from fossil fuel within five years, and thirdly for the updating of the Ethical Investment Policy so as explicitly to exclude fossil fuel companies from the University’s potential portfolio. We might add that these aspirations are not only widely shared across the higher education sector (almost 60 UK universities are now committed to a programme of divestment from the fossil fuel industry), but they accord with national UCU policy. The recent Branch AGM voted overwhelmingly to support People and Planet’s objectives; members are asked therefore to consider signing the open letter. In addition, our Chair has written to the chair of Council about the issue. Do continue to contact us with your views and suggestions. The Committee’s contact details can be found here; we are also on Facebook and Twitter.